An expert independent energy and environmental adviser who as been a media commentator for 20 years and a lecturer in energy studies at University of Toronto is urging the Provincial Government to back away from the current Muskrat Falls development proposal. 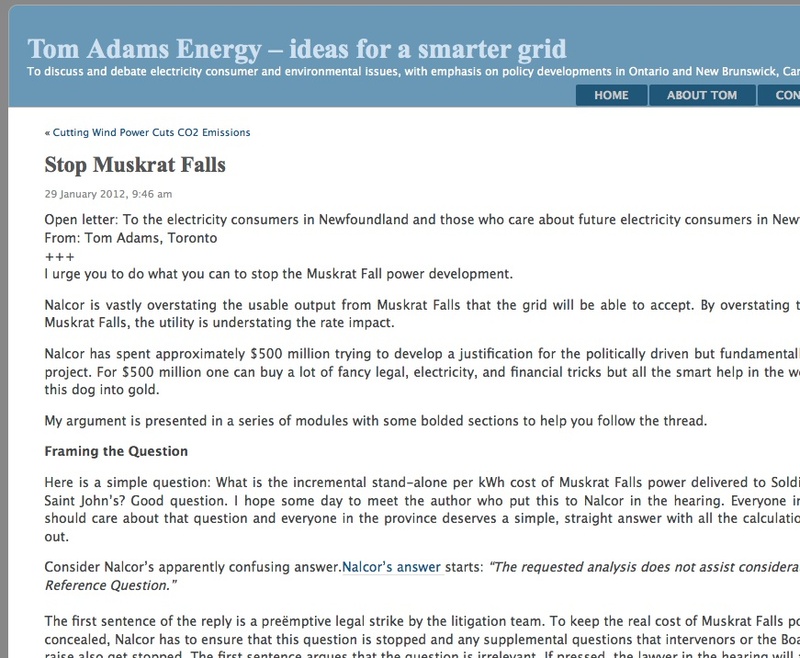 Tom Adams, the former Executive Director of Energy Probe, has posted an open letter to electricity consumers in Newfoundland and Labrador urging them to do what they can to to stop the Muskrat Fall power development. 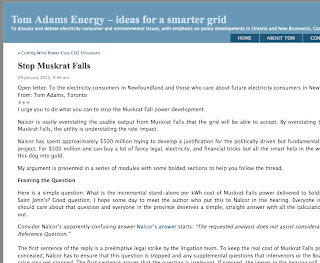 He argues that Nalcor is vastly overstating the usable output from Muskrat Falls that the grid will be able to accept. He says that by overstating the benefits of Muskrat Falls, the utility is understating the rate impact. It is a technical piece, and I have not really had an opportunity to digest it, but folks might want to give it some consideration in an attempt to inform the on-going debate. A few years ago he spoke with CBC Radio in New Brunswick saying that than Premier Williams was recycling an old proposal at a particular inopportune moment, in relation to promoting electricity from Labrador for the New England Market. He suggested NL bury the hatchet with Quebec and concentrate on concentrate on interprovincial cooperation and solving electricity problems locally. One might argue that an arrangement with Emera that takes Holyrood offline meets part of that objective. It is hard to bury the hatchet when Quebec refused to address the heinous Churchill Falls contract and continues to prevent us from transmitting the amount of electricity needed to make the Lower Churchill Project work, through the province.